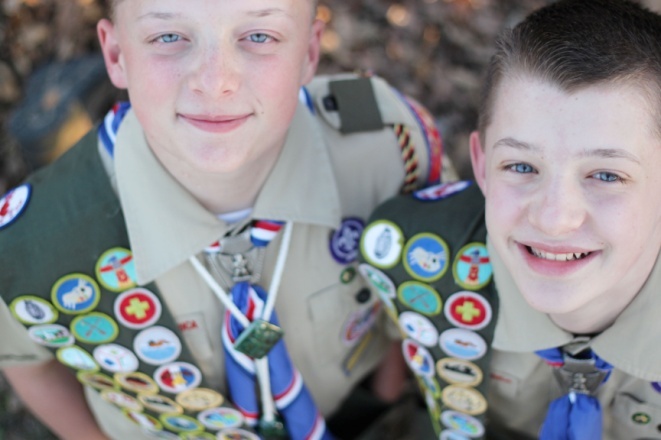 James and Jacob Sorah twin brothers of Boy Scout Troop 1228 of Springtown, Eagle Scout rank recipients, began scouting together at the age of 7 as Cub Scouts. Native Texans born in Fort Worth, they have resided in Springtown with their family for over ten years. They continued through the ranks of Cub Scout to achieve the Arrow of Light (Cub Scout’s highest honor). Crossing over into Boy Scouts brought new opportunities. Their scouting highlights include camping, hiking trek at Philmont Scout Ranch and aquatics including the Mile Swim award. Recently James and Jacob completed BSA’s National Youth Leadership Training (NYLT), which provided a week long intensive for leadership development. The most notable events in their scouting and life achievements focus on service. Service including: canned food and blanket drives for the needy, monthly service at a local homeless shelter, visits to local retirement homes, fundraiser for Japan’s tsunami relief, conservation projects including planting trees and trash clean-up. The vision and focus of both James’ and Jacob’s Eagle Scout service projects were based upon the community public health concern of West Nile Virus. Both projects included public awareness on the prevention of West Nile Virus. James’ project considered the homeless and their limitations to retreat from the pests that spread and affect the deadly virus. His project completed over 100 backpacks for the homeless including hygiene essentials, a blanket, hat, sunscreen, water bottle, Holy Bible, and bug screen. Jacob’s project considered the community and the impact from West Nile Virus. He took a proactive approach to the West Nile Virus by building Purple Martin Housing to provide for a colony over 250 birds. Purple Martins eat over 2000 mosquitoes daily. His project also included planting a tree. Another cherished aspect of service has been for our veteran’s including Flag Retirement Ceremony for local VFW, placing American flags on our servicemen/women’s graves, and the Welcome Home Hero program. James and Jacob have also pursued activities outside of scouting including basketball, karate, 4-H Robotics program and playing the violin. These young men have a passion for their community and country. They are recognized for their contribution at community events for Voter Awareness, Color guard at community events, County and State Conventions as well as campaigning for election candidates. They take this passion to deeper levels as participants and recognized students in Blackstone Institute courses on our U.S. Constitution as well as compete in Moot Court events. James and Jacob are home schooled and are active in their home school community. Both young men are attending NALYE National Youth Advanced Leadership Experience (NAYLE) this summer at BSA Philmont High Adventure Camp. They will continue to serve their troop and community. James and Jacob are the sons of Jay and Karen Sorah of Springtown and have younger sisters Jillian and Jane Elisabeth both of whom are active in American Heritage Girls as well as a younger brother John whom is active in Cub Scouts.